MONTCLAIR, Calif., April 27, 2018	(Newswire.com) - For years’ scientists have debated whether this uncontrolled use of Seawater and turning it into freshwater has effects on the ecosystem of animals and plants living in it. Some say a little pollution doesn't affect the system as the water bodies are big enough to absorb the blow. Others believe the effects are similar to that of an oil spill where a portion of the water is largely affected and is bound to spread. Today the world battles one of the biggest water problems the world has ever seen. It is considered that today we are facing the problem of a water crisis that does not seem to dissipate any time soon. To solve the water needs of the populace, several countries have built Seawater Desalination plants all across the world. Oceans and seas comprise of vast amounts of water that have the potential of quenching the thirst of generations to come. The one tricky detail that today stops us from consuming it is the presence of salt in it. Today we have a solution for this detail. Reverse osmosis is a process that converts undrinkable water into the freshwater fit for use without any health concerns. Before, this was used on a smaller scale, in homes as a purification unit. Later it's applications and it's scope were able to help build some of the best brands in every industry. The idea was that if reverse osmosis can purify lake water for a family of four, a system designed to cater the needs of millions at a time can potentially use Seawater as a source. And hence the use of Desalination plants came into play. 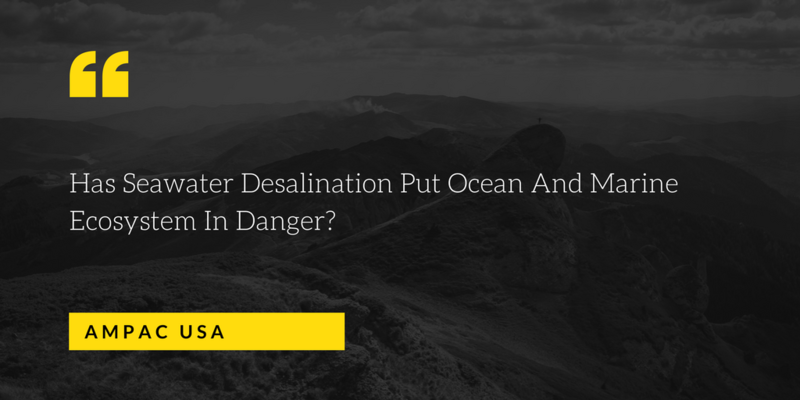 The one major concern that gives many scientists sleepless nights is whether Seawater Desalination has the negative impact on the environment. It is partially because the solution as simple as this seems too good to be true. But also, when the reject of the process is released into the oceans it is concentrated form of input water. This means we are using the desalinated eager but still adding salt in the oceans is basically increasing the quantity of salt in our seas. We know that the freshwater and salt balance in oceans drives the weather across the seas. The change in this balance can have catastrophic results. Not only this but the rejected water that is released into the oceans can have the negative health effect on the marine life in the vicinity. The concerns are valid and huge if they aren't taken care of. Heather Cooley is the co-author of a report from the Pacific Institute in California that examines the effects on marine life related to the building and long-term operations of Seawater Desalination plants in California. This includes both withdrawing gallons of water from the seas as well as releasing highly concentrated brine into the water. The report explores the affect Desalination plants have on specific fish and plankton species which are destroyed during the purification process. Many fish eggs, larvae, and organisms are killed in the intake screens. Whereas the microorganisms which are small enough to pass through are killed on treatment. This has the ability to destroy large amounts of species but the probability of this happening is unlikely and the marine impact of a single plant is very species and site-specific. The concerns, however, are yet to be detailed into and need a lot of research to understand especially the long-term effects on the marine life. Today, several designs, structural and operational changes are already made to ensure minimum marine life impact. This impact assessment is of utmost necessity for the release of brine into the sea for the plant is the most dangerous to the environment at the point of exit of the rejected water. Daniel Cartamil is a marine biologist and an environmental consultant who has a slightly contradictory view to this topic. He believes that Desalination plants have minimal effect on the marine ecosystem. "I have been studying these issues for several years, and my analysis of the available scientific data indicates that the benefits of desalination outweigh its minor environmental impacts," he said in an article of The San Diego Union-Tribune back in 2015. "To deny that there are any environmental impacts associated with such a large-scale industrial activity as desalination would be silly. However, these impacts appear to be minor, and represent the trade-off we must be willing to accept for an increase in water supply to our drought-stricken state" he added. It is, therefore, the question of the feasibility of the process in accordance with the intensity of the present problems. Long-term effects of Seawater Desalination are still in research phase but till then the process is a savior for millions of people around the world each day. All in all, Daniel believes California need not stress themselves with the consequences of a Desalination plant instead should tackle problems at hand that include population growth and development against available resources that have resulted from exploitation of water bodies leading us to Seawater Desalination plants in the first place. Before signing off he did mention the need for investment in research and greener technologies. "Heightened scientific research, monitoring of coastal ecosystems in the vicinity of desalination plants, and innovative technologies to achieve ever-greener desalination methods can ensure that the industry moves forward in an environmentally responsible manner," he said.